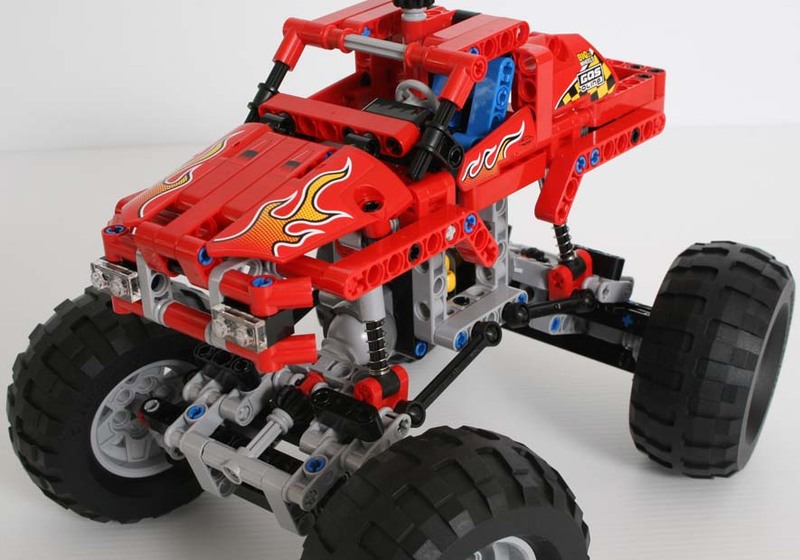 I have built my pre-release copy of the LEGO 42005 Monster Truck Technic set. Then I threw it down the stairs. You know, for science. The bags are not numbered, but the stickers are which seems to be the case for all new sets now. The main model has 74 pages of instructions, while the B-Model has 64 pages. As you can see in the photos, my instructions and stickers were bent as a result of them being packed loosely in the box. I don't know why LEGO don't standardise on using cardboard backing for every set's instructions, not just the large ones. 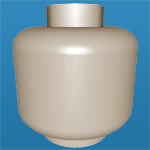 There are no new parts or colors in this set, although the Steering Ball Joint parts 92910 and 92911 have so far only appeared in 8110 Unimog U400 and the 9398 4 x 4 Crawler. There wasn't too much to this build, it took me about 1.5 hrs. The age group on the box says 9 to 16, which I guess reflects the relative simplicity of the build. On the other hand, this simplicity gives the truck a lot of strength so it can take a good battering (which came in handy at the end of this review!). 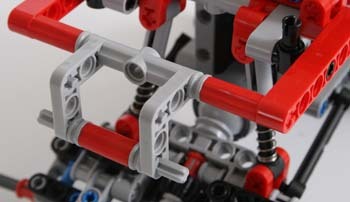 The Steering Ball Joints are nice parts and provide a great deal of movement for the wheel axles. While building up the frame, it's not terribly exciting or pretty to look at. Although once the panels for the truck's body start going on it looks great. The body does look a little small compared to the wheels in my opinion, but I guess that's what a Monster Truck is supposed to look like? Since my wife wouldn't let me smash my kids' creations with this truck, I had to settle for the next best thing - dropping it from a height. And to pretend to be scientific about it, I restrained myself and slowly built the height up. Obviously, the truck handled drops from 1m easily. Although it's hard to make it land and stay on it's wheels since it likes to bounce all over the place. 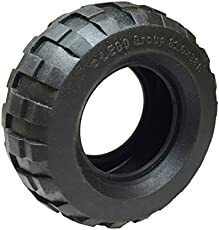 In most cases, the tyres would come off the wheel hubs after each drop. Dropping from 2m had much the same result. The truck would always bounce away and land on it's side or top. Still, nothing broke off from the main body. Only the tyres slide off the hubs each time. I was a little worried that something would actually snap for this test - probably the 6L Links. So while parts definitely flew off the truck, I'm glad to say that no LEGO was harmed in the making of the video below! The most destructive drop was when it didn't land flat and so immediately crumpled into many pieces (the photo on the right). Putting that back together was a bit of a challenge! 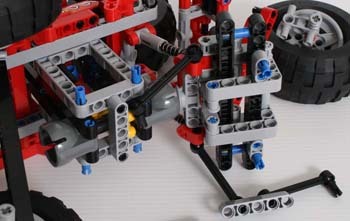 Unlike the larger Technic sets, the B-Model instructions come printed and included in the box for this set. It is some kind of supercharged hotrod car. It looks cool, but I think the main model is far better. 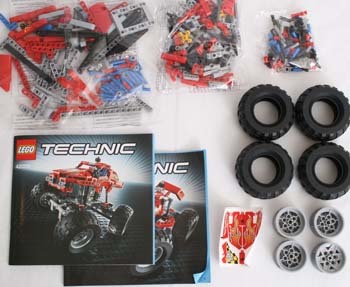 I will build it later and update this review. I think this is a very fun set. I'm not sure how much it will be selling for but if it's similar to other sets of the same size, it will be a great one to pick up. Not a terrible mid-range set, and the B-model is not too shabby. This will make a fairly good parts pack, but it's just not that stand out. We've had a couple of years with a few excellent sets, and this is kind of meh. 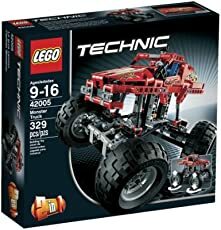 The four-wheel steering parts, suspension and ball-joints are useful though.<br>I think this is an Amazon sale kit for me.<br>As Aero88 says 8588 was a classic. This brings to mind the Rebel Wrecker (8858) which is a favorite of mine.